Dunkirk Disambiguation:Building Our Ryan Homes Dunkirk: Is That Green on the Horizon? Is That Green on the Horizon? Just let me say how sick I am of dirt. Piles of dirt. Muddy yucky gross dirt. We've been surrounded by a dirt moat for the last two and half months - but maybe, just maybe, the end is in sight. Take a look at what just happened! MISSING: One big, ugly pile of dirt. FOUND: One crap-ton of rocks. Big rocks, little rocks. All kinds of rocks. 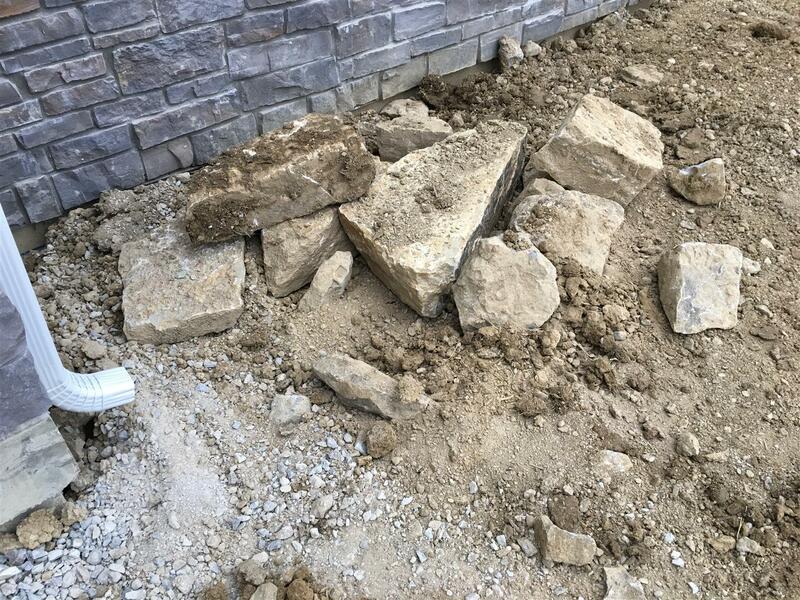 Since some of the rocks that have graced our site are about the size of the iceberg that sank the Titanic (I'm exaggerating, of course), we decided to try to save some of them for landscape accents. I am pretty sure the didn't realize how many of them would be uncovered in this process. In other landscape news, we have been in touch with GreenPro - the local contractor who performs the final grade and landscaping - for about the last two weeks negotiating the price to sod most of the backyard. Yes, we are THAT sick of dirt. And the thought of having to deal with straw and seed for the upcoming summer makes us want to gag. So we're going to cover all with luscious green wavy grass. Extra money? Sure - but grass is green too, it's an acceptable trade - and the cost is much less than it would be if we waited to do it later. I say almost because we are opting out of sodding last twenty feet of our yard that is part of the drainage easement where seed has already been planted and seems to be doing just fine. It's a drain - do we really need sod there? We're also building a deck, so I decided not to lay sod that we'd just be ripping up in a month or so. Out key concepts were multi-level and no railings. We also are trying to find the happy space between having a deck that is too large or too small. 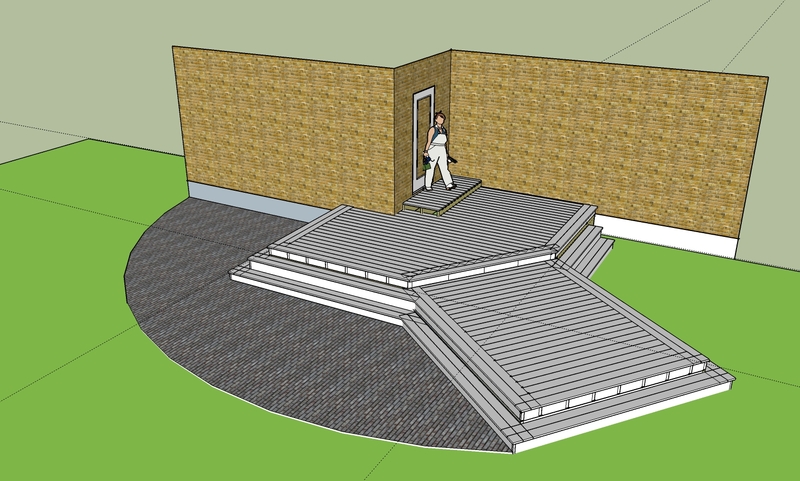 This version has steps all around that flow the deck into the yard. The 10x12 foot lower level is a step down and we think we might add a white pergola over it at some point. This summer, we're only doing the deck. 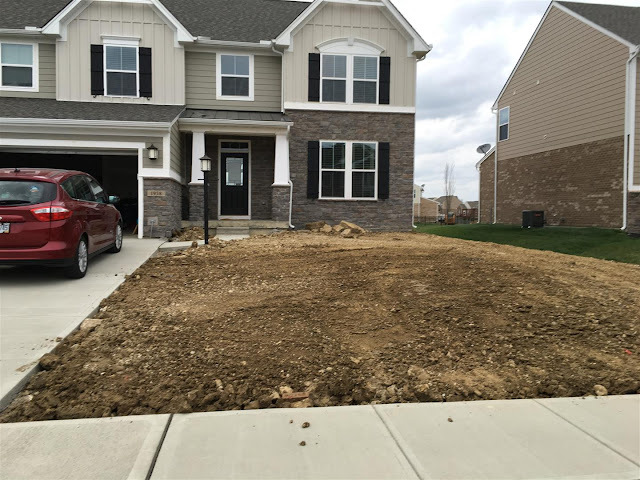 We haven't decided on pavers or concrete, but either way, we want to wait until the ground around the house settles before we do the hardscape. In short, PROGRESS! We are finally closing in on being done with the big projects and soon we'll be able to only focus on the little fun projects - like organizing the garage. Doesn't that sound like a blast?